Yes, I did. I suppose you recently visited Moscow with your wife and also visited Lenin's mausoleum? So, how is it now? I was there in 1969, when I was in 4th grade, I was 10 years old. My mother took me there during one of our trips to Moscow, because for a soviet citizen it was a must to visit it. I was never in the mausoleum before, but my mother decided that I was old enough for this and that it will be something to report in one of the classes when back to school in fall. We came to the Alexandov garden very early in the morning to get into line. A line of visitors was formed in Alexandrov garden. You had to wait in line to get into the Lenin's mausoleum. We came several hours earlier than the opening hour. There was a huge crowd of people there, but unlike any other line in Soviet era, this one was organized and pretty civilized. While we waited for the mausoleum to open, I had lots of fun playing with other kids from the crowd. Then the line started to move steady and within an hour we got to the Red Square and then to the mausoleum. Frankly speaking, I was not very enthusiastic to see a dead person in a coffin. Honestly, I did not want to do it AT ALL. But I suppose, it was "an honor", not many kids from my school happen to have this experience. When we got inside, I was so scared and so nervous already, that I was having involuntary muscle contractions in my arms, they were shaking. It was cool and semi-dark inside; in every corner a soldier was standing at the wall on the crowd way. We went through a small room in a semi-circle. In the middle of the room there was a podium with Lenin's corpse. I gave it only a very short glance, I was not able to look at this longer. I was looking under my feet all the way. It took us probably less than a minute to pass the way, but it seemed like an eternity for me. When we got out of this place into a sunny day, it was a complete relief for me. 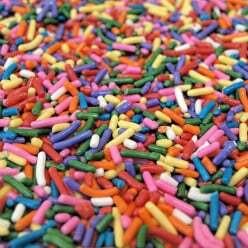 Only later I confessed to my mother what a torture it was for me. She apologized and said that she considered that it might have been beneficiary for me because then I had to tell about it at school. She also said that it was not a real dead body of Lenin, but likely a preserved with formalin stuffed doll. 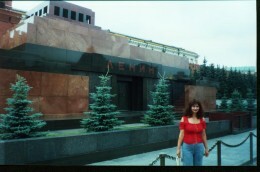 It was my only time of visiting the Lenin's mausoleum. During my numerous visits to Moscow even a thought about it never came to me. ReuVera - the picture is relatively new as it was taken 10 years ago when I was visiting my then fiancee in Ryazan (she is now my wife and living in the U.S. with me). We took a train to Moscow for the day but the tomb was closed (it is only open a few hours a week now days). When we were there no one was paying attention to it as the the crowds and honor guard were gathered around the corner along the part of the Kremlin Wall where the grave of the Unknown Soldier from World War II (Great Patriotic War) is located. Ironically, I was on a college sponsored trip to the Soviet Union in March of 1969 and we toured the tomb during the Moscow portion of our trip. The line was very long just as you described, however because we were foreign tourists, our Intourist guide simply took us directly to the head of the line. That gave us more time to spend our U.S. dollars in the foreign currency stores as well as exchange them for Rubles to spend in regular stores like the old GUM Department store along the edge of Red Square opposite the tomb (the Soviet Union desperately needed foreign currency at that time). Like you, my impression was that the body in the tomb was simply a wax figure. However, subsequent research has revealed that it really is the embalmed body of Lenin and the same family of undertakers that first embalmed Lenin is still caring for the body and doing touch-ups every few months. However,even they can't save it forever as he is only supposed to last another 20 or 40 years before time takes its toll and the body disintegrates. What places are worth visiting (other than the popular tourist sites) in Moscow and Saint Petersburg? Trump was still seeking Moscow tower in 2017.